Governor Rick Scott has signed a proclamation declaring Friday, February 7th as Florida School Crossing Guard Appreciation Day. Today we are honoring the men and women who ensure students have a safe journey to and from school. 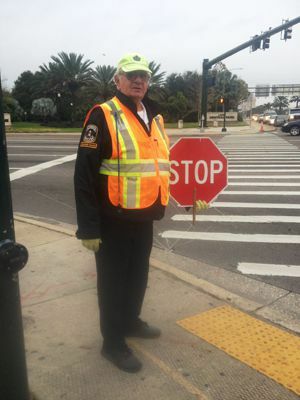 Crossing guards are out there everyday during the week to get us safely across the street. They keep our children safe from traffic throughout the year—no matter what the weather conditions may be. Drivers, bicyclists and pedestrians all owe a huge thanks to our unsung heroes. Even if you don't normally see crossing guards in your everyday route, there's probably several working near where you live or work. Crossing Guard Appreciation Day provides a great opportunity to introduce yourself and say "thanks" for his or her efforts in keeping our community safe. Jim Dodson Law surprised Roger, 77 years-young and another guard on busy Missouri Avenue today in Largo with free movie and popcorn passes to show our thanks. We appreciate all of you for your dedicated work in keeping our young pedestrians safe!